I had every intention of producing a range of delicious Easter recipes for you, but life and work have been incredibly busy the last while, so I have run out of time. 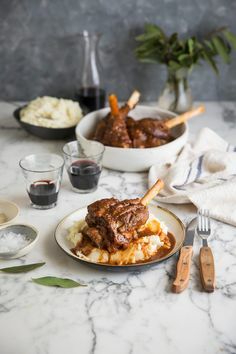 I did, however, manage to make theses Lamb shanks with red wine, rosemary and bay leaves, which are perfect for Easter, or the whole of winter really. I made them in my amazing Instant Pot and they cooked to a fall off the bone and meltingly delicious texture in 75 minutes total with only 50 minutes of pressure cooking time. Since I constantly seem to be running out of time my Instant Pot is so helpful, especially for dishes like this. I also didn’t want to deviate too much from classic flavours here. I mean, why reinvent the wheel. I absolutely love red wine, rosemary, bay leaves and garlic with lamb. This recipe is a classic and a keeper.